During the performance I sit on a low stool surrounded by the audience (also on low stools) in a kind of intimate storytelling environment. I tell a story which relates to a three-month walk I undertook in the summer of 2009, on which I followed my own voice’s echo through the Italian and Austrian Alps. 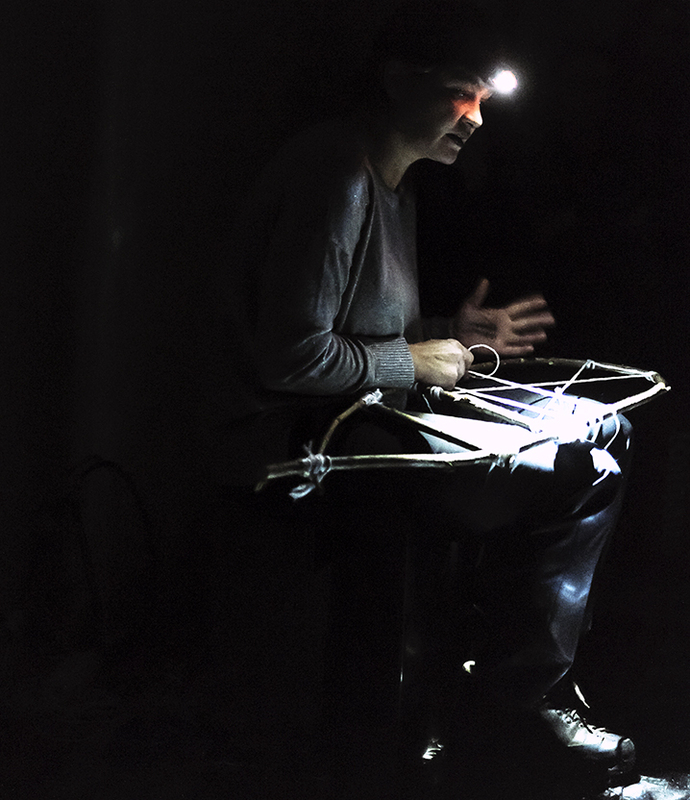 The story concentrates on five days during which I was surprised by a severe thunderstorm and snowed in on my own in a metal bivouac box, 3000 meters up in the southern Ötztal Alps. 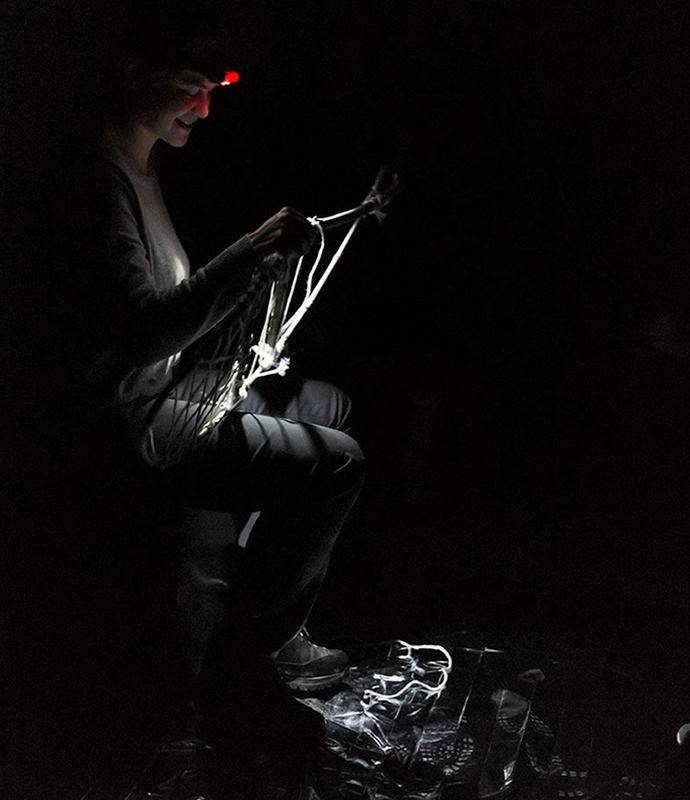 Identical to the actual light condition in the bivouac shelter, the only light in the room - is the headlamp I am wearing. 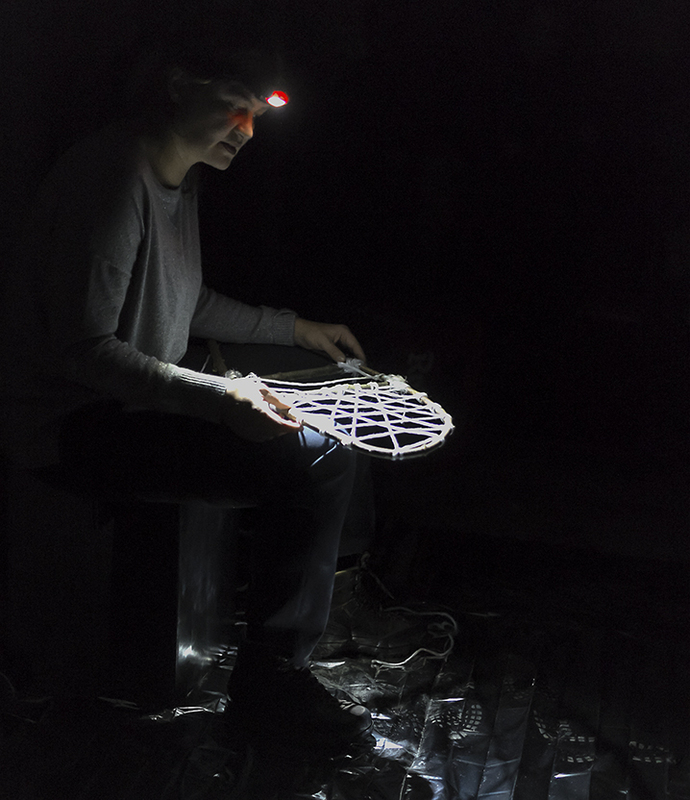 My stool is placed on a silver rescue blanket, an item which is frequently mentioned in the story I tell – and the light of the head lamp reflects off this when I look down. 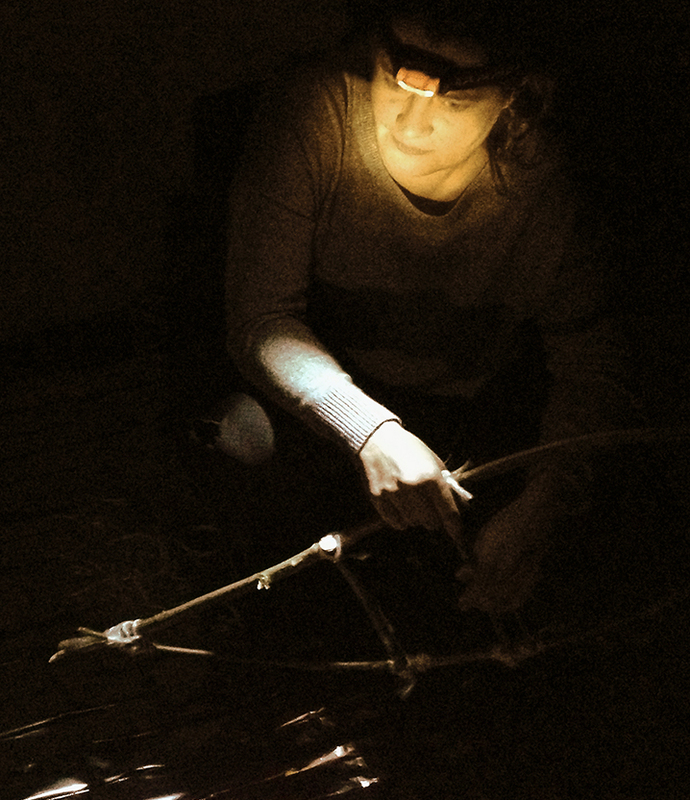 While talking I mostly look down - toward my hands as I am weaving a triangular pattern with nylon string over a tree branch bend and tied together to a kind of fish shape – I am making a snowshoe, similar to the ones I made in the bivouac shelter in preparation of my descent in the deep snow. While snowed in I developed a tooth ache, and my cheek had begun to swell. After being snowed in for three days, I had used up all my painkillers and my urgent departure was required to seek dental assistance. As the conditions refused to diminish I found myself in a difficult situation; I had to prepare for the walk down the mountain with what I had at hand. I improvised the necessities: I made some gauntlets out of the recue silver blanket; I melted candle wax to my walking stick to create a flair; I collected all the waste and spare gas cooker cartridges in a rubbish bag to make a kind of molotow cocktail that in the case of an emegency I could easily set on fire in order to attract attention; and finally I made a pair of snowshoes from some nylon string and the rodsystem of my tent. 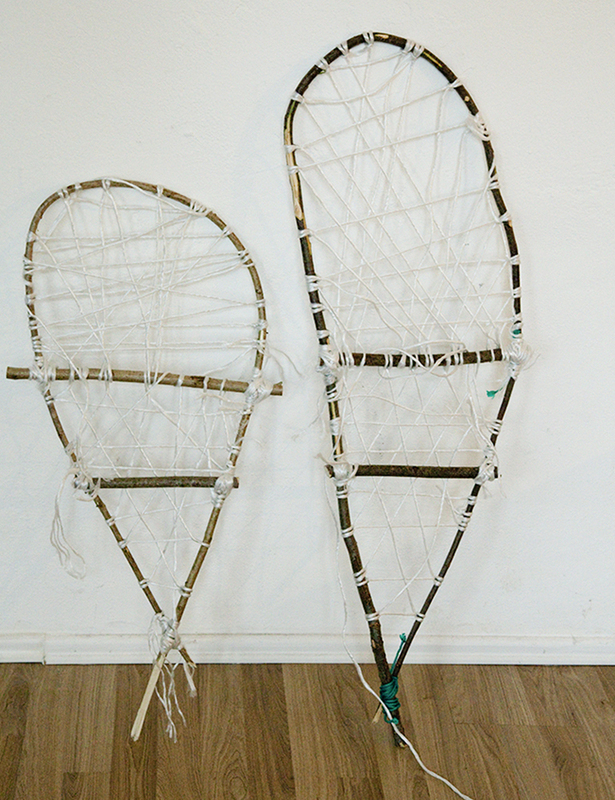 Throughout the relaying of the narrative, I am working on the weaving of the snow shoe – sometimes I stop weaving when I need to concentrate more on the telling of my story, and sometimes I stop talking when I need to concentrate on the weaving and unraveling of the threat.